Home › Blog › Home Buyer Bonus Deal! With summer around the corner and the weather finally starting to warm up, buying a home might be in your foreseeable future. Working with a realtor that is not only extremely knowledgeable and experienced, but provides you with an awesome send off to enjoy at your new home. Russ Ravary offers you a buyers bonus gift when you buy and close on a home with him as your realtor. Russ has a list of items to choose from up to $500 in value. 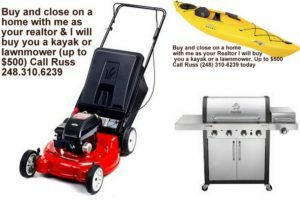 The items to choose from are as follows: Lawn mower, snow blower, tv, grill, kayak, and more! Russ’s previous buyer clients loved that they got a nice housewarming gift at the end of their transaction with Russ and you will too! Russ recently helped me purchase a home, this was my first time and i was extremely nervous. I was nervous i would get a realtor that didn’t really work hard to get me the best deal possible. that was not the case with Russ, he tried and did everything he could and used every bit of his knowledge to get me a deal on a home i was satisfied and comfortable with. I couldn’t have asked for a better realtor for my first time buying a home and i’m so glad my friend refereed me to him. I also know that he help my friend and his wife sell their home in order to purchase another better fitting to their needs now that they have a kid and one on the way. He was great with them and they swore by his knowledge and experience that i would be just as happy as they were working with him. The best choice i made was listening to hem and working with Russ as my realtor. I totally recommend him to anyone in any situation looking to buy or sell a home! Russ helped me sell my home in Wixom in under 10 days. He came through my house prior to listing it and told me what I should do to make the home appear spacious and uncluttered. It was amazing what taking out a few pieces of furniture and removing the clutter makes. He then was very patient with me as I wanted a specific type of home in downtown Milford. It took us 6 months but I got the home I wanted. I would highly recommend Russ to anybody! Russ Had just helped me with my home and figuring out what to do and the best way to go about it. i am getting ready to list my home and he is a great adviser. He knows the ins and outs of real estate which make it easy for me to make the best choice possible for my family and I. We are looking for a lake home now and he is truly knowledgeable. i can’t wait to see some of the houses he has sent us and to see what our home sells for. this whole process is a lot and being our first move since we bought our first home, and we are looking for a very specific property style, while also having a long list of wants and needs to go along with it, working with a realtor that can deliver is and was very important to us when we were trying to find someone. Russ helped us from the very first phone call and every since. We totally trust his opinion and it hasn’t steered us wrong yet. If you are looking for a realtor with lots of experience i would try calling Russ he has helped us so much already and our journey has just begun. If you are ready to start looking for your dream lake home and do not want to miss out on the best lake home deals get the latest home listings emailed to you. Click the button below to get started. Ackerman Lake Lakefront Foreclosures for sale. There are plenty of Waterfront homes for sale Commerce MI check them out! lake listings Clarkston MI for you and your family! Oakland County lakes by Size find the one thats just right for you!